Most did not know what to expect going into the Masters A tilt at Frank Leversedge field at Lochside Turf Friday night. This Game of the Week selection did not disappoint as people were treated to an exciting game that saw Cowichan 49ers defeat Cordova Bay Bobcats 3-1. 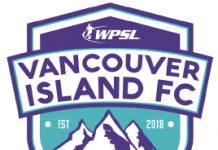 VISL Cowichan VS Cordova Bay September 30 2016 ISN, Jay Wallace – Island Images. 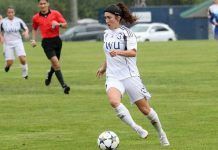 Cowichan remains undefeated and in first place – not bad for the team as this is their first year in the League. First year for the team, but there is plenty of experience on the Cowichan team. As recent as last year, 5 or 6 of the Cowichan players played with the Gorge FC Backfit Masters team. 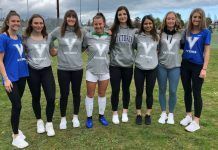 Once Cowichan decided to join the VISL in the Masters A Division; several of the Cowichan based players decided to also stay home to play. Players of note that decided to stay home to play were steady defender Richard Lord, players Erik Fuller & Ryan Fusick, and potentially one of the divisions best central midfielders in Darcy Kulai. The 49ers got stronger by adding Keeper Rob McIntyre who transferred to the Cowichan C team last year from Gorge and they also added a sparkplug in George Thomas who knows how to play well and get under the opponents skin. All led by former VISL multiple champion of the Jackson Cup and MVP, Coach Kevin James. The game itself started out with a quick pace and Cordova Bay was dominating early. They struck early with a goal from Jeff Brown at 7’. A great finish – it looked like the Bobcats were going to have their way with Cowichan. Cowichan continued to battle and were able to even the score with a beautiful free kick from George Thomas. Off the post and in; no chance for Keeper Chris Davies. That was at 43’ and seemed to really deflate the Cordova Bay team that was riding high for the majority of the half. After the restart, Cowichan took advantage of some less than spectacular defensive play from Cordova Bay and they were able to go ahead after a corner kick from George Thomas found its way to the back of the net. The goal at 47’ seemed to uplift Cowichan and put Cordova Bay in a hole. Cowichan scored another goal at 65’, this time it was Erik Fuller after a very nice buildup and passing play deep in the Cordova Bay third. The Bobcats were frustrated at this point and perhaps had some misplaced passion that turned into multiple yellow cards for Cordova Bay during the next 30 minutes. This also led to 2 players being sent off from Cordova Bay in the later stages of the match. The Final whistle blew and all that was left was to decide the Man of the Match. Kulai was great in the midfield as was Thomas who had 2 goals. In the end, it was decided that full back Darren Moilanen of Cowichan receive the honors. A rock on the back line had a great match and was busy fighting off the Cordova Bay attackers. Darren receives a certificate from 1550’s Pub Style restaurant and a gift from Heineken. Entertaining game that was spirited and a good showing of Masters (Over 35) soccer here on the Island.